We invite you to join us at our Open House for age 2–grade 12 on Saturday, November 3 from 10 AM to 12 PM. * Our Open House is the best way to discover our amazing teachers, learn about our advanced curriculum, and meet our fantastic current students and parents! The school year just began, but Admissions has been busy for weeks preparing for the next school year! We, at BASIS Independent McLean, are excited to announce the launch of our application for the 2019-20 school year. We are accepting applications for PreK (three year olds) through grade 10. We invite you to join us at our Open House for preschool–grade 12 on Saturday, March 3 at 10 AM. Our Open House is the best way to discover our amazing teachers, learn about our advanced curriculum, and meet our fantastic current students and parents! At Open House, prospective families will follow a mock schedule based on grade level and experience our academic program, expert teachers, and student life in action. What better way to learn about our school than from a current student! Mackenzie F. ’24 is a first-year BASIS Independent McLean student, who likes physics, the friends she’s made at school, and her teachers. She has enjoyed school so much that only two months in she applied and was accepted as an admissions student ambassador. She says it was the Student Visitor Program that cemented her decision to attend BASIS Independent McLean, and she can’t wait to share that same experience with other prospective students. We invite you to join us at our Open House for preschool–grade 12 on Saturday, December 2 at 10 AM. Our Open House is the best way to discover our amazing teachers, learn about our advanced curriculum, and meet our fantastic current students and parents! At Open House, families will select sessions to visit to experience our academic program, expert teachers, engaging extracurriculars, and student life in action. We invite you to join us at our Open House for preschool–grade 12 on Saturday, November 4 at 10 AM. Our Open House is the best way to discover our amazing teachers, learn about our advanced curriculum, and meet our fantastic current students and parents! At our first Open House of the 2018 admissions season, prospective families will follow a mock schedule based on grade level and experience our academic program, expert teachers, engaging extracurriculars, and student life in action. It is pure joy and magic entering the Early Learning Program at BASIS Independent McLean. Students are full of smiles and engaging in a variety of activities. The walls are decorated with many projects from math and art, to literacy, and more. 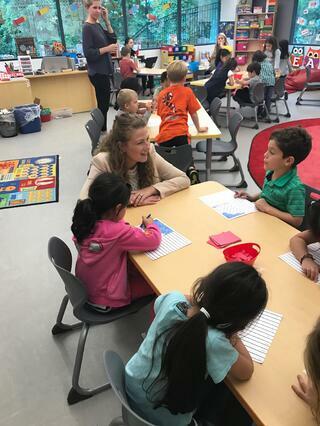 We sat down with Mrs. Cassandra Korik, the Director of Early Learning Program at BASIS Independent McLean, to ask her the top seven questions from prospective parents about our Pre-K1 (3s) and Pre-K2 (4s) program. FAQ #1: How do you balance rigor and play? We are able to balance rigor with developmentally-appropriate practice in a joy-infused classroom. Teachers lead our above grade level curriculum in a fun and interactive way, meeting both the academic needs and interests of students. We offer engaging and individualized lessons within each of our Discovery Blocks of Learning: Social and Emotional Development, Language and Literacy, Math Discovery, Expressive Arts, Mandarin, Movement, World Discovery, and STEM. Learning becomes more real and tangible for our students when they are able to apply knowledge in their own lives. We see this through teacher-guided play. This kind of intentional teacher-facilitated play contributes to the many foundational skills children need for later school success, including self-regulation, social skills, creativity, original thinking, oral language development, eye-hand coordination, literacy and math skills, and positive attitudes toward problem solving. Through these combined practices, student learning accelerates. Students will be walking our halls again in 24 short days, but as per usual Admissions is already busy preparing for what’s next! Our team is excited to announce the launch of our application for the 2018-2019 school year at BASIS Independent McLean for preschool (3s and 4s)-grade 10. The school year isn’t the only thing that is new about this admissions cycle; we have an entirely new way for your family to apply. We have partnered with Ravenna Solutions to offer what we believe is a more simplified and sibling-friendly application process. Our new application allows parents to manage the submission of supplemental materials, event registration, and even view decisions in one central location.